amazake densetsu　甘酒と伝説　legends about Amazake "sweet rice wine"
sake 酒 is usually an alcoholic drink, but Amazake is without alcohol and therefore loved by women and children. 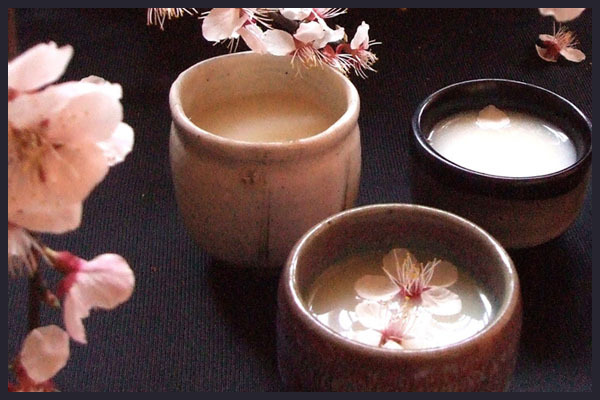 On cold days it is warmed up and thus a special treat.
. Japanese Drinks for all seasons . Various regions have legends about an old mountain woman (hag) who likes Amazake or comes to sell Amazake. She comes in various versions. 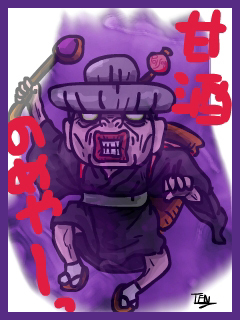 Amazake-babaa 甘酒婆 "Amazake hag" is an old woman yokai from the folklore of Miyagi and Aomori. She comes to the doors of houses at late night asking for amazake in a child like voice, but if anyone answers they fall ill. It was said that to keep her away, a cedar leaf is placed in the doorway. 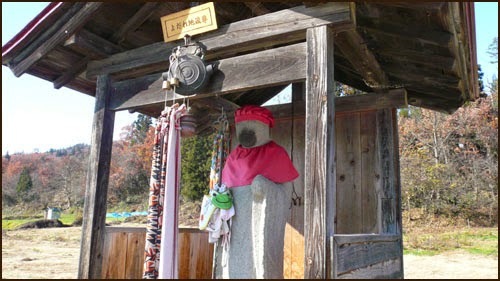 The Jizo statue of this temple is modelled like the old woman who sold Amazake at the access road to the temple. "After my death I wand to become a Deity to cure Cough 咳の神 and help healing all the other people with this ailment." 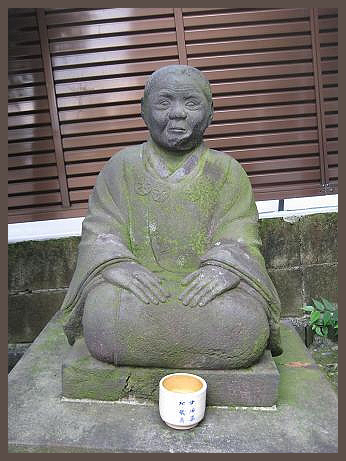 So a statue was made of the woman but seen as a Jizo statue.
. hoosoogami 疱瘡の神 deity of smallpox .
. Atago Gongen 愛宕権現 .
. amazake Jizoo 甘酒地蔵 Jizo and sweet rice wine . She knocks at the door of houses at midnight, asking for Amazake in the voice of a child, but if anyone answers, they become ill. To keep her away, a cedar leaf is hung in the doorway.
. Sugawara Michizane　菅原道真 天神 Tenjin Legends . grandfather went to town to sell some things. In the mountains he met Onibaba, who took away all his luggage. 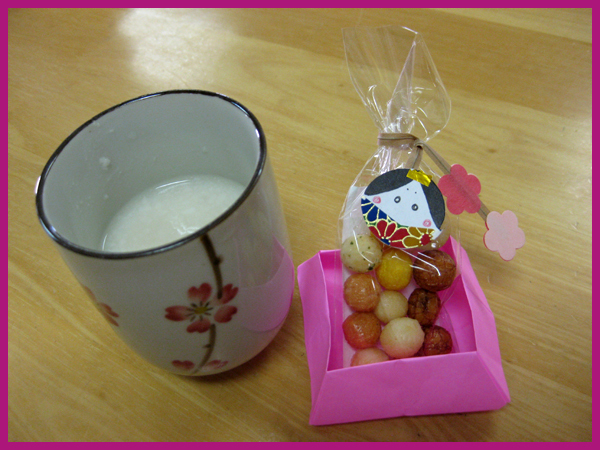 The next day he went there again and brought her rice cakes and Amazake. After she had eaten them, she fell into hot water and he killed her. So he could take revenge on this enemy. 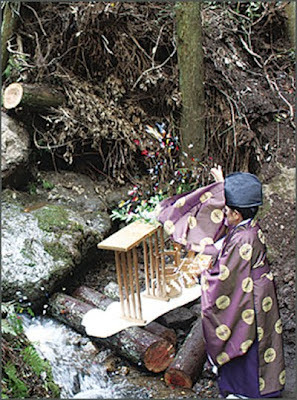 The Mikogami of Okayama like Amazake, therefore people bring offerings to their shrines every time they prepare some. If she is of bad temper for some reason, she can cause wounds and other diseases for the children. To appease her, people bring Amazake to the shrine. in Mikamo village, Kuroda Jinja 黒田神社 Shrine.
. mikogami　御子神　Honorable Child Deity . It is not allowed to grow nuts or grapes in the garden. 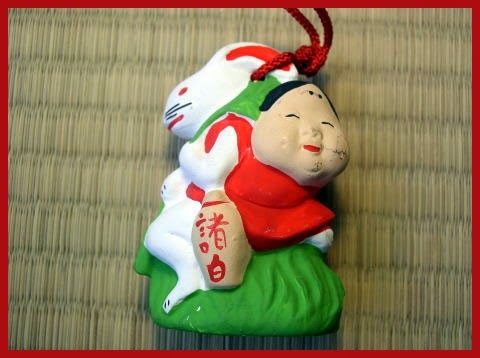 Miso should not be made on u no hi 卯の日, the day of the rabbit (hare). Amazake should not be made on tatsu no hi 辰の日, the day of the dragon. She comes to the village late every night, knocks at the doors and wants to sell Amazake or real Sake. So many people put a poster at their kitchen door, saying they do not like these drinks. Then she will stop visiting. Posted By Gabi Greve to WASHOKU - Japanese Food Culture and Cuisine on 12/03/2015 08:07:00 p.m.
. Famous Places and Powerspots of Edo　江戸 . 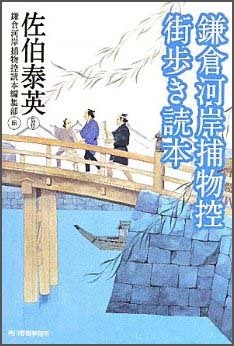 At the beginning of the Edo period, when the town was just re-structured by Tokugawa Ieyasu, a lot of construction wood and stones came via the Kamakura region (Sagami no kuni 相模国), with workers coming from Kamakura to heop unloaded at Kamakuragashi. The tradespeople built their homes nearby, soon called Kamakura village. 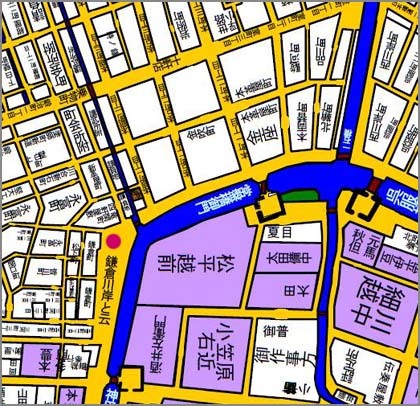 In a map of 1657, it is mentioned as 「かまくら丁」. Ieyasu also had the Koora ke 甲良家 Kora family from Omi settle here . The head of the Kora family was a master carpenter (daitooryoo 大棟梁) and helped build Edo castle, Senso-Ji and other famous temples, even the 日光東照宮 Nikko Toshoku shrine. There are some legends alive in the village. It begun selling some snacks and a cup of sake to the workers in the evening, thus being the first "Izakaya　居酒屋" pub in Edo. Soon other yatai　屋台 food and drink stalls came up in many parts of Edo. Toshimaya, the oldest sake store in Tokyo, originated when its founder, 豊島屋十右衛門 Toshimaya Juemon, opened a sake store and tavern in 1596 at Kamakura Waterfront in central Edo (modern day Tokyo). At that time, large-scale renovation work was being carried out on Edo Castle, so people flocked to Kamakura Waterfront, and Toshimaya is said to have prospered enormously. Furthermore, when Juemon began brewing shirozake (white sake), its reputation spread throughout Edo. 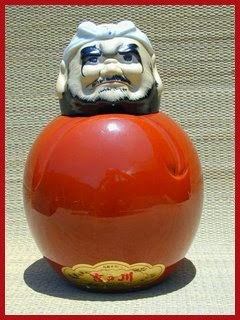 Shirozake is a sweet rice liqueur that was popular with women at the time. Indeed, it was from this time that the Japanese custom of offering shirozake on Girls' Day, the annual event during which people pray for girls' healthy growth, is said to have begun. As a result, Toshimaya's shirozake is cited in many novels and traditional Japanese Kabuki plays. Even today, Toshimaya preserves the traditional recipes and makes shirozake once a year. Nowadays, our sake brewery is located in Higashi-Murayama City in west Tokyo, where sake, shirozake and mirin (sweet cooking sake) are brewed. Our sake, Kinkon (Golden Wedding Anniversary in English), has been awarded numerous gold prizes at the Annual Japan Sake Awards, and is used as the sacred sake at the famous Meiji Jingu Shrine as well as Kanda Myojin Shrine. Kinkon is skillfully produced by our brewers and, as one of Tokyo's representative sakes, it brings value to many of our customers.
. satookibi, satoo kibi 甘蔗 Satokibi, sugar cane . Documents show that sugar was first brought to Japan from China in the mid-eighth century as a luxury used mainly as a medicine. The primary source of sweetening in ancient times was either maltose candy or amazura ivy extract. 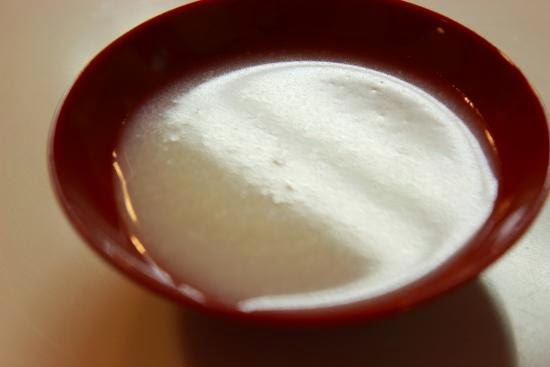 As trade with the continent flourished from the fourteenth to seventeenth centuries, imports of sugar increased and its use expanded as a sweetener used in cooking. 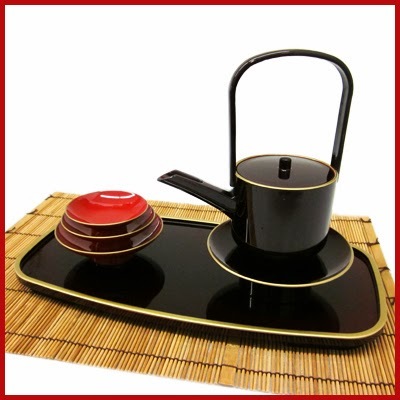 The practice of the tea ceremony spread among the upper classes during this period, and sweets made with sugar were developed to accompany the tea. The tradition of sweets that evolved along with the tea ceremony—virtual works of art created from sugar—form a culture of confectionery that Japan can be proud of. It was not until the eighteenth century, however, when sugar cane began to be cultivated in Japan, that sugar became more readily available to the common people.
. Tanuma Okitsugu 田沼意次 . encouraged the trade of white European sugar via the merchants of Nagasaki. He also introduced the plant satokibi , first grown at his request at a Nichiren temple, the Ikegami Honmon-Ji 池上本門寺 in the South of Edo. From there its growth spread to other suitable areas of Japan. - Ikegami Honmon-Ji 池上本門寺 - - More in the WIKIPEDIA ! 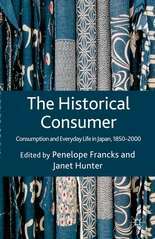 I argue that although sugar was consumed as a luxury item in early-modern Japan, in the early decades of the twentieth century, and especially during the war years, the consumption of sweets became inseparable from the idea of Japanese modernity, linked to the act of consumption within the sphere of Japanese empire.
. Legends about Jizo Bosatsu - 地蔵菩薩 - 01 .
. Join the Jizo Bosatsu Gallery - Facebook .
. Botamochi Jizo ぼた餅地蔵 . 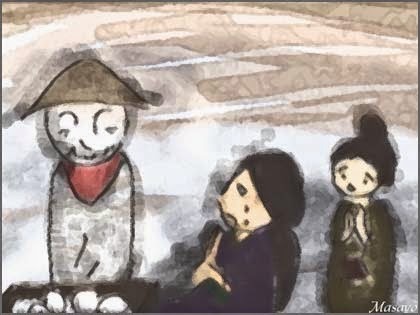 In some legends, Jizo eats the Mochi offerings, in others they are made in greatfulness. On the days with nine in the ninth lunar month (09, 19 and 29) it is customary to prepare Mochi with the newly harvested rice and offer them to the deity. The old ladies and housewifes offer three each to Inari, 月山様 Gassan, 日月様 Deities of Sun and Moon, Jizo, 馬の神様 the Deity of horses, Fudo Myo-O, 金精様 Konsei sama (Deity of the Male Symbol) and 権現様Gongen sama.
. shitogi mochi しとぎもち / しとぎ餅 fried or uncooked rice cakes . 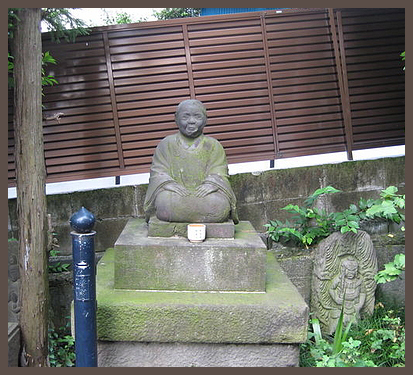 There was a stone statue of Jizo. 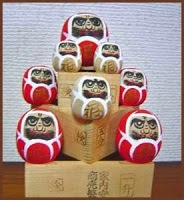 This Jizo would become the play companion for children. 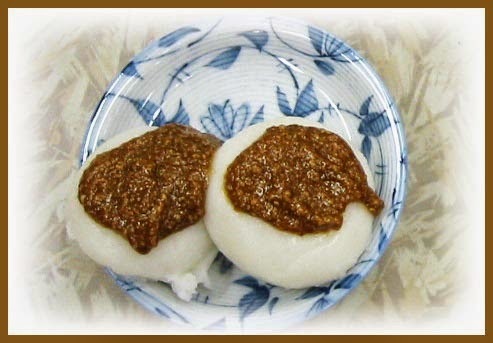 And sometimes it would eat azuki mochi 小豆餅 red bean mochi .
. yodarekake よだれ掛け - 涎掛け bib, baby bib . the kind and honest 正兵衛 Shobei and the greedy 慾兵衛 Yokubei lived in a village. 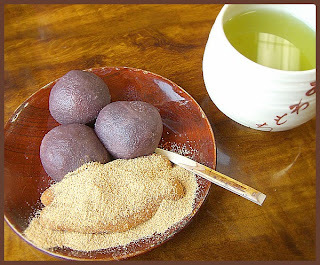 The poor Shobei, who could not afford Mochi made from white rice, pounded some of millet and offered it to the deities. His neighbour Yokubei was quite rich and pounded white Mochi. Shobei wanted to make some offerings to the Jizo statue by the river, so he put some Millet Mochi in his bag and took a bucket to get New Year's Water by the river. 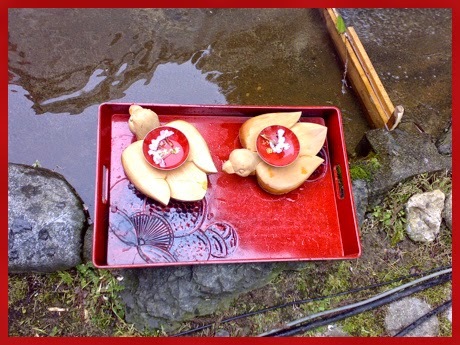 He walked along the river, but when he wanted to put the Mochi up as an offering for Jizo, he could not find them any more. They must have slipped out of his pocket somehow, so he apologized profoundly to Jizo. "I just ate your Mochi which have come floating past. They were quite delicious!" When Shobei looked more closely, he could see some powder around the mouth of the Jizo statue. So Shobei thanked Jizo with all his heart and went home. On the way home his bucked suddenly felt very heavy and when he looked inside at his home, he found that it was filled with small and large gold coins. When Yokubei heard the story from Shobei, he got all envious and went down to the river himself. 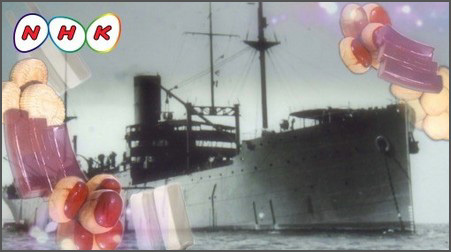 He stuffed some of his white Mochi into the mouth of the statue and then hurried home. But his bucket was filled with heavy stones and horse excrements . 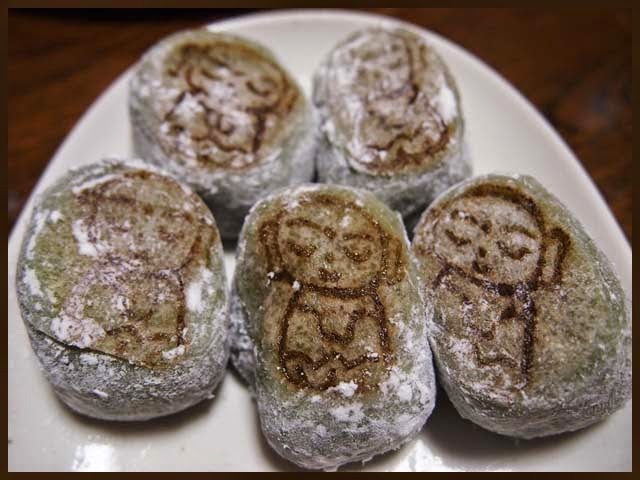 . .
To thank Jizo, Grandfather made some Mochi for him. Since there was more food than the old couple could eat, they had the mice invite their animal friends over, and everybody prepared the food together. Then the old man stacked the boxes of special New Year's food and rice cakes that they had made and took them to the Jizo-sama statues. "Jizo-sama. Now I can make you an offering. Thank you."
. 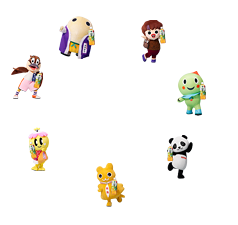 - Mochi 餅 rice cakes and 妖怪　Yokai monsters - .
. Japanese Legends and Folktales . 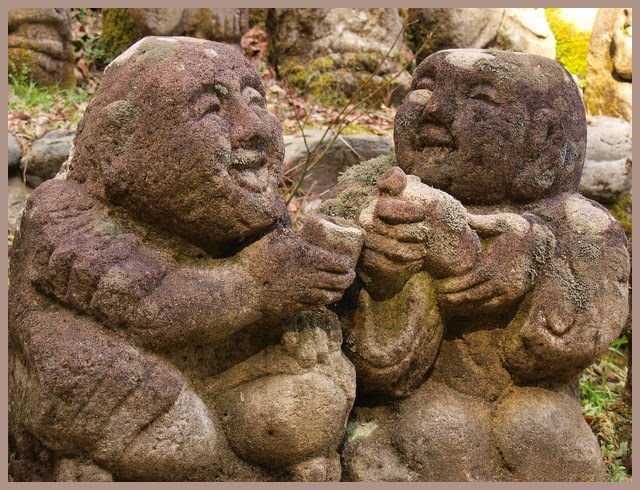 Posted By Gabi Greve to Gokuraku - Jigoku on 5/12/2015 09:47:00 a.m.
. Japanese Legends and Folktales - Introduction - .
. Sake 酒 and local (monster) legends 妖怪伝説 .
. 大威徳神社 Daiitoku Jinja 大威徳山神社 Daiitokusan Jinja . 大鷲神社 Otori Jinja "Eagle Shrine"
The one at temple 安食町の龍角寺 Ryukaku-Ji in Ajiki village is between 印西 Inzai and 印東 Into, where the monster used to pee. The swamp 印旛沼 Inbanuma is a left-over from his pee. The mountain behind the shrine 大鷲神社 was left there when it fell from his back while he was carrying it to a different place. 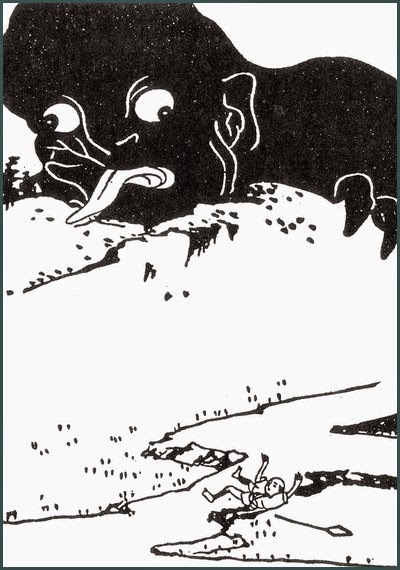 was a gigantic yōkai in Japanese mythology, sometime said to pose as a mountain range when sleeping. 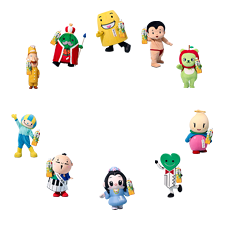 Daidarabotchi's size was so great that his footprints were said to have created innumerable lakes and ponds. 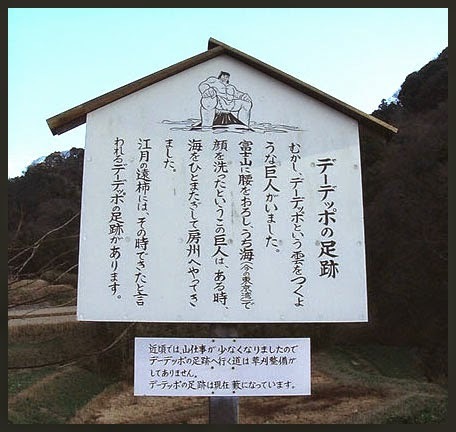 In one legend, a Daidarabotchi weighed Mount Fuji and Mount Tsukuba to see which was heavier. But he accidentally split Tsukuba's peak after he was finished with it. The Hitachi no Kuni Fudoki, a recording of the imperial customs in the Hitachi Province compiled in the 8th century, also told of a Daidarabotchi living on a hill west of a post office of Hiratsu Ogushi who fed on giant clams from the beach, piling the shells on top of a hill. Izumo no Kuni Fudoki also mentions a legendary king of Izumo, Ōmitsunu, who was the grandson of Susano'o and a demi-god. Having the strength of a giant, he performed Kuni-biki, pulling land from Silla with ropes, to increase the size of his territory. join this group from the age of 18 to about 30. Twice a year, in Spring and Autumn, they assemble at the home of the village chief, bringing food for a feast. In the tokonoma alcove they hang a scroll of Yama no Kami 山の神 God of the Mountain and stay up all night with lantern light. Eating the special bandei mochi with a prayer for safety during the work in the mountains, they drink and dance all night. Two special representatives have to stand before the God of the Mountains to perform prayers in the evening and morning, so these two take a seat at the top of the table. Since the God of the Mountains must be kept pure without ritual pollution, the sake for the god must be served by a woman not married (a virgin).
. Food specialities from Fukushima 福島 .
. yama no kami 山の神 god of the mountains - in winter . 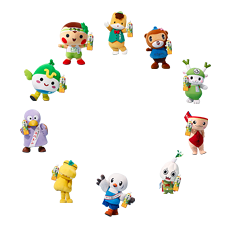 Yashinboo Doosojin やしんぼ道祖神 Yashinbo Dosojin, "Malicious Dosojin"
yashinbo卑しん坊 means someone who wants anything around him. Near the Shrine 鹿島神社 Kashima Jinja there are three small stone sanctuaries for these wayside gods. 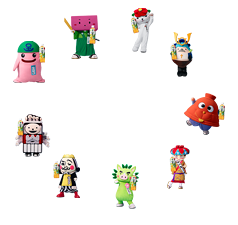 They offer their help and grant a wish if you bring some o-sake whilst making a wish. On the other hand, if you take away just one stem of the wild sasa bamboo around, they will get angry and bring harm. Most farmers who come to worship here bring offerings and clean the place carefully.
. doosojin 道祖神 Dosojin - "wayside gods" . .- Hihi 狒々/ 狒狒 / 比々 Hihi Baboon Monster - . 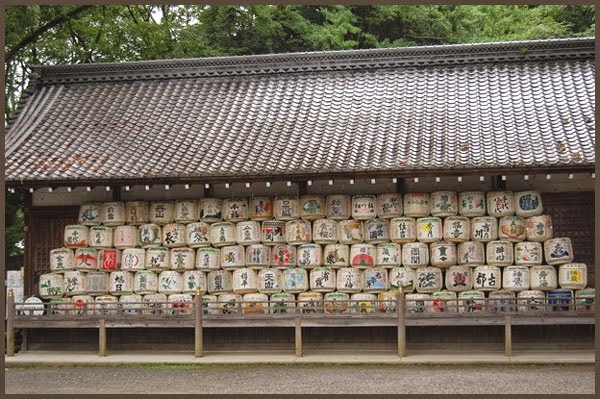 Once a man took three barrels of sake away from the Shrine, but after that he became very sick. When he brought them back, he was healed. Posted By Gabi Greve to Japan - Shrines and Temples on 5/01/2015 01:53:00 p.m. The god of sake was also the god of rice growing and harvesting. So when the people prayed for good growing conditions and thanked the god for a good harvest, they connected with the god of sake. Sake linked the people to their gods, and then linked people together in congeniality. In this way, sake took on a vital role in religious festivities, agricultural rites, and many different ceremonial events, from marriages to funerals.
. . . Sake is more than a drink taken to enjoy a tipsy time — it also serves a vital social purpose at the defining moments in life. The following is a summary of the many pages about Sake in the Darumapedia. It will be updated regularly, so please come back visiting. Matsuno'o Taisha - Matsu-no-o . A shrine to celebrate the making, selling and drinking of Sake. Before cutting down a big cedar tree, the wood cutter pours a cup of sake on the stem and roots of the tree and says a short prayer. Then the chainsaw starts to work. Drinking sake is a social event. You never pour your own cup, but have a friend (or payed geisha) sit at your side for that purpose. Once your own cup is emptied, you pour a drink for the other person. There are special manner manuals on how to do this properly.
. miki, shinshu お神酒 Sake of the Gods . Rice wine (sake) offered to the kami, a necessary part of the food offerings known as shinsen. Usually referred to as omiki, or alternately as shinshu, the term miki is a combination of two characters, the honorific mi and the character for "wine" (ki).
. . . . . In ancient documents, miki is also called miwa, and the deity Miwa no kami 三輪の神　is thus famous as the kami who presides over sake.
. sakaki 榊 sakaki tree, Cleyera japonica, masakaki . The sacred tree of Japanese Shinto. 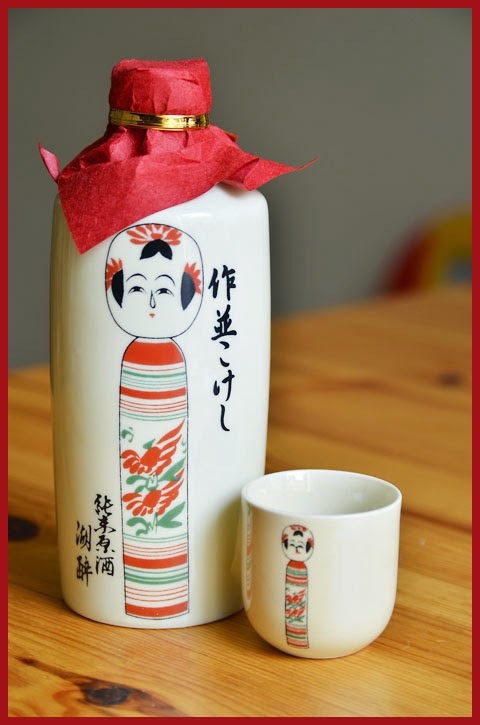 In the Edo period, Mirin was drunk as a sweet sake. Otoso, traditionally drunk on Shōgatsu New Year was made by soaking a spice mixture in mirin. It can be seen as a kind of herbal medicine for a long life. In the Kansai style of cooking, mirin is briefly boiled before using, to allow some of the alcohol to evaporate, while in the Kantō regional style, the mirin is used untreated. Kansai-style boiled mirin is called nikiri mirin (煮切り味醂), literally "thoroughly boiled mirin." "thrice three, nine times"- "three three nine times"
This ceremony is a ritualized drinking of sake by the couple, and sometimes their parents as well which serves as a binding ceremony. There are three sakazuki (ceremonial sake cups) stacked one on top of the other in a tier. Both the bride and the groom sip from each cup three times, hence the "three three nine times". Three cannot be divided in two, making it a particularly lucky number for a wedding in Japanese culture. 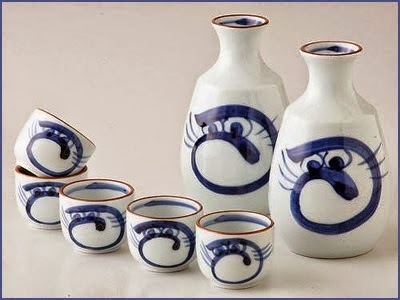 There are many different ideas about the symbolism of the three sake cups. Some believe it represents heaven, earth, and mankind, others believe it represents the love, wisdom, and happiness which grow over time in a marriage. Another source says the three cups represents three human flaws of hatred, passion, and ignorance. 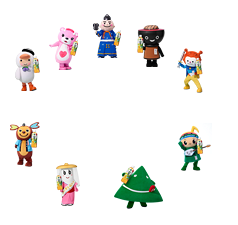 Because this is such an old tradition, there are many variations. 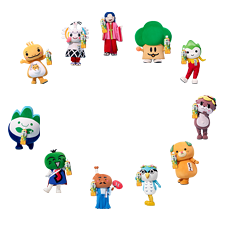 For example, sometimes parents join which expands the symbolism of three, as there are now three couples. Occasionally, couples only sip three times (only once on each cup), instead of three times on each cup. 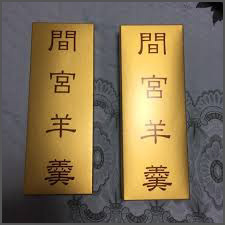 Technically, this is incorrect, as the name defines the ceremony as "three three nine times".
. Kenpaishiki 献盃式 in memory of Saint Shinran . After some meetings and rituals and also at the winning party of a sumo wrestler, a large sake cup 大杯 is handed around and each one has to take a sip.
. Naorai 直会 banquet that accompanies a matsuri .
. Naorai at Kashima Shrine 鹿島神宮 Kashima Jingu .
. enju hai 延寿盃 Enju sake cup for a long life .
. hana no sake 花の酒 rice wine for blossom viewing .
. hatsumoode 初詣 first shrine visit of the New Year . Often there are edible gold flakes in the first auspicious sake cup.
. jichinsai 地鎮祭 ground-breaking ceremony . Before construction work, to pacify the earth deity and to purify the spot where construction will be carried out.
. jirooshu 治聾酒 sake to cure deafness .
. Kaenashi no kenpai 栢梨の献盃 . For the butsumyooe 仏名会 Buddha's Name Ceremony in winter.
. kijizake (kiji sake) 雉子酒, "pheasant ricewine" . Offered to all New Year visitors to the Emperor's palace.
. kiku no sake 菊の酒 chrysanthemum sake .
. nihonshu no hi 日本酒の日 Sake Day - October 01 .
. drinking sake from a hand fan - a dance .
. tsukimizake　月見酒 drinking sake while moon viewing .
. yukimizake 雪見酒 drinking sake whilst viewing the snow falling . Many rituals are also kigo for haiku.
. WKD - Ricewine, rice wine (sake, saké, saki) Reiswein . 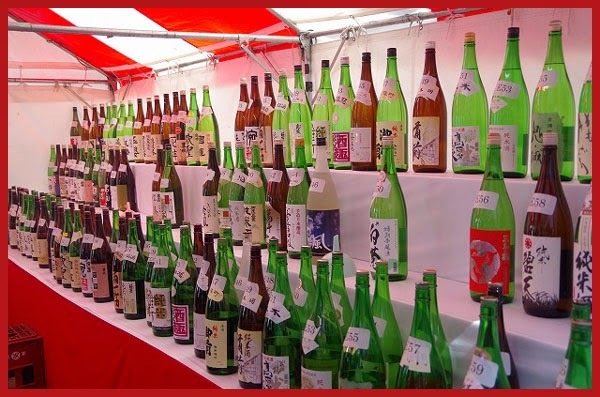 sake matsuri 酒祭り　- Sake festivals are very popular ! Most festivals have a religious origin, but some are now rather commercial with the objective to sell local sake. At the shrine 白川八幡神社 Shirakawa Hachimangu in Gifu, there is a festival where doburoku rice wine is brewed for this shrine festival and then served to more than 5000 visitors.
. Food and Drink from Gifu prefecture 岐阜県 .
. Furukawa no okoshi daiko 古川の起し太鼓 "wake-up drums from Furukawa"
The participants wear white headband, white "tabi (Japanese socks)" and stomach band made from bleached cotton. Hida in mid April is still chilly and blows cold wind at night, but it has no effect to their body heated with sake and high spirits.
. . . the crowd is given super yummy sake in bamboo cups. Kyokusui no En 曲水の宴 "floating poems on water"
A poetry ritual held at various shrines and parks in Japan. Kyokusui was a pastime of the nobility in ancient times. A lacquer sake cup was set adrift in a stream and the participants, watching on a downstream bank, had to compose a short poem and then drink the sake in the cup when it reached them. Sake brewers from all over Japan come here to pray. Hiroshima annually ranks 4th or 5th in volume of sake produced, and Saijo is one of Japan's most famous brewing districts. In celebration of this, once a year everyone goes to the local park and attempts to drink as much of it as possible. You can wander around the breweries and sample some of their products (the free stuff is generally lower quality though). Or join the masses in the Sake Hiroba 酒ひろば in the park, where for ¥1300 (¥1600 on the day) you get your own little cup from which to sample the 900 kinds of sake from all over the country on offer. If you get there in good time there is plenty of high quality stuff to be had, and it's a great opportunity to experience the diversity (and potency) of sake. There is no re-admission to the main Sake Hiroba, so if you want to do tour the breweries and stagger around the back streets, you should probably do that first.
. bishonabe, bisho nabe 美酒鍋 hodgepodge simmered with sake only . bisho nabe びしょ鍋 : The workers in a sake factory were called "bisho" , from the sound of splashing water, bisho bisho ビショビショ. For the Chinese characters, the present version was then choosen for more effect, meaning "Beautiful Ricewine" 美酒鍋. The festival is fun with a lot of sake drinking, however the background of the festival is rather more serious. and consumed even by monks and priests at prestigeous temple compounds.
. masuzake, masu sake 升酒 rice wine served in a wooden masu .
. Azuki-Arai 小豆洗い Monster washing azuki beans .
. Doosojin 道祖神 Dosojin Wayside Deities . Some couples are exchanging a coup of sake (shuugizoo　祝儀像). Usually he holds the small cup and she pours for him. Or he holds a ladle and she holds a fan (杓扇).
. Fujiwara no Hidehira 藤原秀衡 (1122? - 1187) . 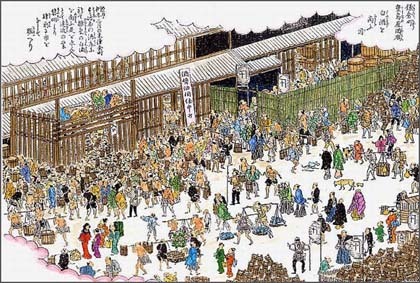 Hidehira had his son promise to continue to shelter Yoshitsune and his retainer Benkei, but the son gave into Yoritomo and surrounded the castle with his troops, forcing Yoshitsune to commit seppuku (his head would be preserved in sake and given to Yoritomo) and resulting in the famous standing death of Benkei. Yoritomo destroyed the Fujiwara domain and killed Hidehira's son.
. - Kizakura　Gekkeikan キザクラ　黄桜　"Yellow Cherry Blossom" - .
. Matsuo Basho　松尾芭蕉　the haiku poet and his sake and sakazuki .
. . . and poems about people being drunk . . . There is also a sweet potato schnaps with this name.
. sakazuki 杯／盃／坏 small cup for sake .
. 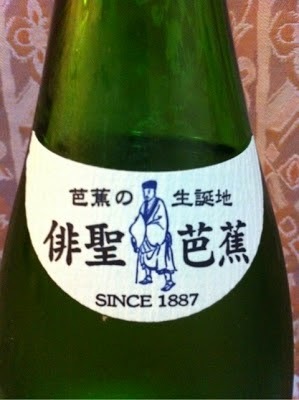 Sake no Hosomichi 酒のほそ道 "The Narrow Roads of Ricewine" .
. Suzumon 鈴 家紋 Suzumon Family Clan . Sake has been linked so closely to shrines that we have a common saying "sacred sake is offered to every god". Since the gratitude and prayer for good harvest of rice are key elements of Shinto, sake, or rice wine, is essential for festivals and rituals. Therefore, it was common that priests brewed sake in shrines.
. . . Long-lasting sake brewing since ancient times is handiwork that predecessors respecting gods and nature have cultivated. Suzumon continues to dedicate our sake to Toyoakizu shrine, our local tutelary god, and Kumano Hongu Taisha shrine, which our ancestor has a link with, when the Rei-taisai festivals (regular rites and festivals) are held, cherishing our link with these shrines.
. tokkuri 徳利　sake flask . 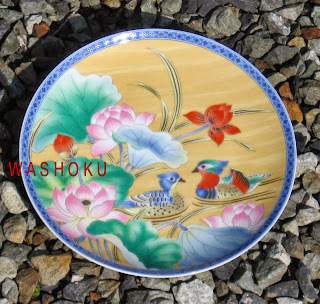 CLICK on the photos below for more sake and mingei times !
. tenugui 手ぬぐい small hand towels . A shrine in Kyoto to celebrate the making, selling and drinking of Sake. Also introducing other shrines closely related to sake. Posted By Gabi Greve to Japan - Shrines and Temples on 4/21/2015 09:37:00 a.m.